Felt a bit brave the other night, so I decided to solo the King’s Forest wilderness. Normally, this would not be a big deal, but for the recent realization that thar be dragons! At first, progress was slow. I buckled down and did a little Unquiet Graves on Epic Hard, and was amazed by the fact that Citira was quite capable. The recent “rejigger” of my enhancements made for a wonderful discovery: Holy Retribution was quite useful! As mobs began to form around me- bluddy drow- , I would punch HR and find a good portion of the mob lying on the ground, no longer a threat. Eyebrows raised, and unshakable smile upon my lips, I repeated this tactic. Only a few times was I disappointed. After Unquiet Graves, I ran into a red named necromancer in the wilderness. He was a bit tough, but it wasn’t long before I had him beat. Then, as I continued on my way around the wilderness, I found myself in a grove. I remembered to take a screenshot! As I battled the beast, I realized that, for whatever reason, it was not able to knock me down as much. This entitled me to run back up and continue to wail on it with my weapon. When it fell to my blade, I let out a howl of victory. 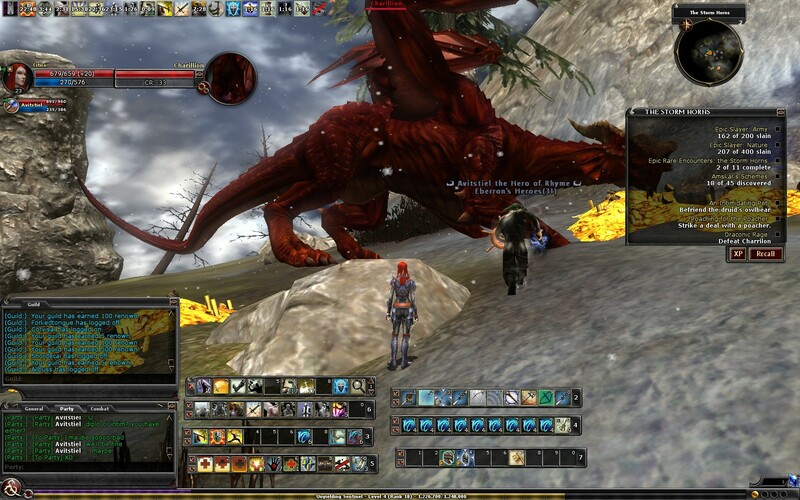 I had soloed my first dragon in an Epic run! For some of you, I’m sure this is not a huge accomplishment, but you have to realize that I’d never done this before. So for me, this was a huge boost to my confidence. Now, credit where credit is due, I must admit that the enhancement redo was not of my own thoughts, and that was the reason why the difference was so tremendous. So it is with great pride and gratitude that I mention Tom Hewitt (@Illarvin) as the instigator of these changes. I have other people to thank, too. @DDORage and DDOMicki from twitter spent a detailed conversation with me on how to improve my defenses. They helped me raise my AC a bit, while Tom helped me with damage. Though these increases were both slight, they have definitely helped, and I credit this victory to them! You three rock! Saturday night, I wasn’t sure what to do, and had nobody around my level from guild online at the time, so I decided to take Citira and explore the wilderness of the Storm Horns. Things started off well enough. I stuck to my usual path in any wilderness: Start at the edges and work my way in. I wound up on the opposite side of the map from the entrance, and then I realized. My Lay on Hands weren’t regenerating fast enough, and I was almost out! I use LoH for the majority of my healing, so this was very bad. Spell Points were also at a premium at that moment, so I couldn’t use spells too much, either. So there I was: Solo and running out of support for myself. Everything I could normally do was gone, or depleting fast, and I had no option but to teleport back to the gate, and let myself regenerate. Just before I did, however, a guild mate logged on, and- after a quick greeting- I mentioned what I was doing. Apparently, my activities intrigued him, because after a relog, Avitstiel (aka Attivi) joined me, and we headed back out to the Storm Horns! I had my usual difficulty in keeping up. I had 30 movement boots on, as well as my Least Dragonmark of Passage (Expeditious Retreat), and he still left me in the dust. Anyway, we had fun, running through the wilderness and laying waste to everything that crossed our paths (more Attivi than myself, though I did what I could. He just kills things too quickly). It was a while before we suddenly came across the first thing I saw that I was pretty certain I couldn’t kill. “I’ma die,” I said “so bad right now!”. THE RED DRAGON! Holy crap, was my heart racing. Needless to say, we survived. I was pleasantly surprised, though I suppose I shouldn’t have been, when the thing fell to our mighty blows! It wasn’t long after that that we reached the peak of the Storm Horns, and was I surprised when we did! Many times on the way up the mountain, we stopped to look down upon the scenic view of the forest below us. I expected this time to be no different, and rushed to the edge to take a look. 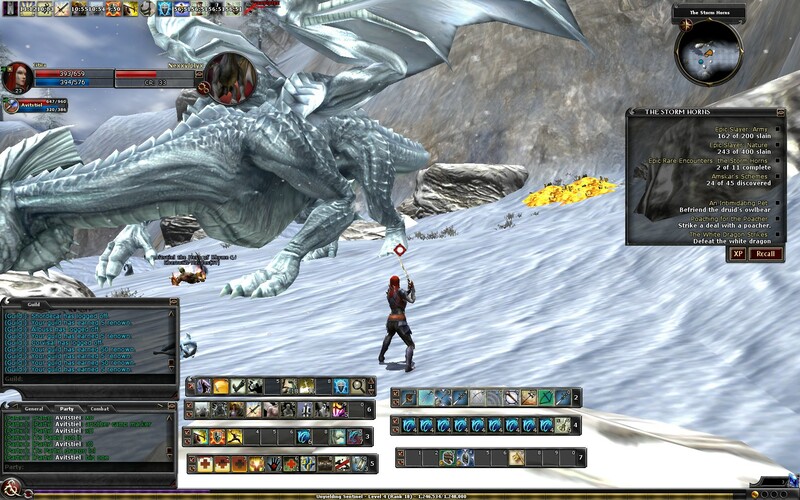 WHITE DRAGON swooped down to protect his treasure (you can see the pile of gold and the like on the screen shot above)! Not one, but TWO dragons appeared before us on that run! I was excited, and figured I’d be waiting for Avitstiel to pick up my stone so that I could rez at the nearest shrine! Riding high upon the adrenaline of the kill, I rushed over to the reward that lay before us (OH, PLENTIFUL BOOTY! ), only to be a bit dismayed. What was in the chest was a fair bit less than I expected. The creature had been a red name rare, so I figured there would be at least one blue-border item. There was not. I also had hoped for some sort of Commendation (preferably Druid, as I am still attempting to get the Druid Goggles from the Eveningstar traders. Holy crap on a stick, that was more than I had even hoped! This xp didn’t come from killing the dragons. No, the dragon xp was only a small portion of that 111k! Between hitting almost every Commentary, and the slayer bonuses, we easily hit over 150k each! If I remember correctly, Avitstiel earned around 100k more than I did (lower level pc)! Thanks, Attivi! If you’re reading this, I had a blast and look forward to doing it again sometime! To the rest of you, Thank you so much for stopping by and reading my inane prattle. I hope you gained some enjoyment out of it, and that I see you back real soon. 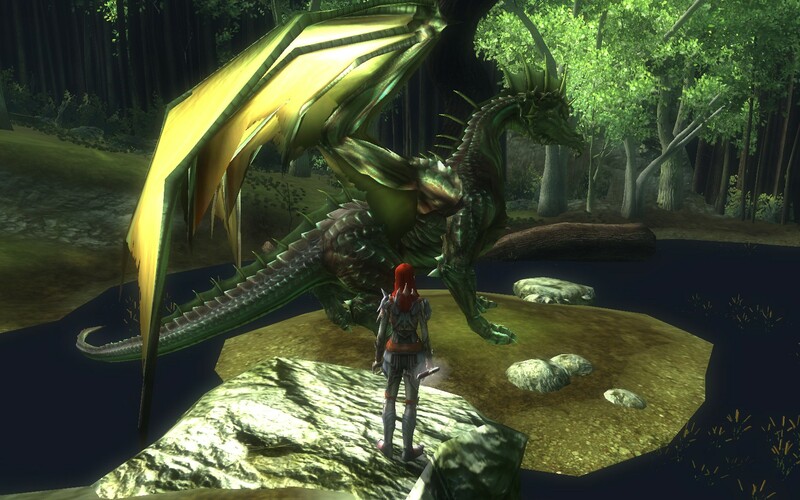 My questing buddy Allbuss and I spent some time in King’s Forest Wednesday night. We were seeking Elminster’s numerous message-stars that were hidden throughout the place. There’s forty! 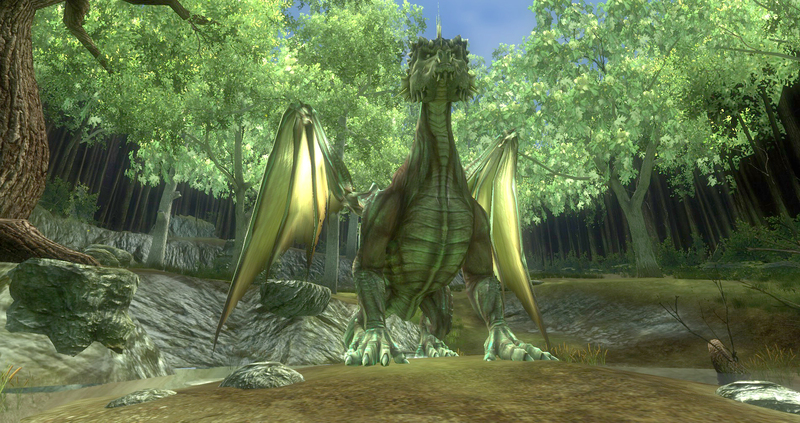 We found them all, but the really interesting part is that we came across two green dragons! This excited me a little too much, so I forgot to take screenshots (sorry! ), and in the end I thirsted for more. The first dragon was a bit of a pushover. He knocked me down a few times, but that was pretty much it. Between Divine Sacrifice, Exalted Cleave, and Exalted Smite, it didn’t last long. I do have to thank, in part, the healer hires we brought along. I may not have lasted at all had they not healed me when I was down. Allbuss, too, did more than his part, though he was on the other side of the dragon, so I didn’t see him too often. The second dragon, however… wow, that was a fight! This dragon forced me to spend most of the time on the ground while it whittled away at my health (thank you, Embrace of the Spider Queen for protecting my prone body!). Again, Allbuss was typically opposite me while we battled the beast, but it was clear he was trying to take the dragon’s focus off of me while I was helpless on the ground. In the end, we defeated both dragons. I spammed a lot of Divine Sacrifice and Exalted Cleave, hitting Exalted Smite only occasionally. When both lay lifeless on the ground, the feeling began to ebb, and I realized I wanted to fight MOAR (purposely misspelled) dragons! Alas, I was stuck with drow (Drow is the Word), undead, and spiders. Final tally for XP was over 100K, so it was a night well spent. Even without that much xp, I would consider it a night well spent! I’m three quarters of the way to level 23, and only need one more Druid Commendation to get my goggles! WOO! This here ends the tale of the (not-so-)tedious Elminster Message Hunt. Have fun in the world, everyone. Hopefully, I’ll see you there! 🙂 I’ve actually never seen dragons in storms horns. I’ve cleared the wilderness on one toon (that is picked up all the messages so your map is clear), and I’ve run a few times the long way to the north camp, yet no dragon. Point of note: Dragons show up in Epic, so that may be why you never saw them before. I never ran (or knew) Gianthold on Epic before, so that’s why I was surprised. 🙂 I usually run on epic, but I don’t really run around wilderness that much.